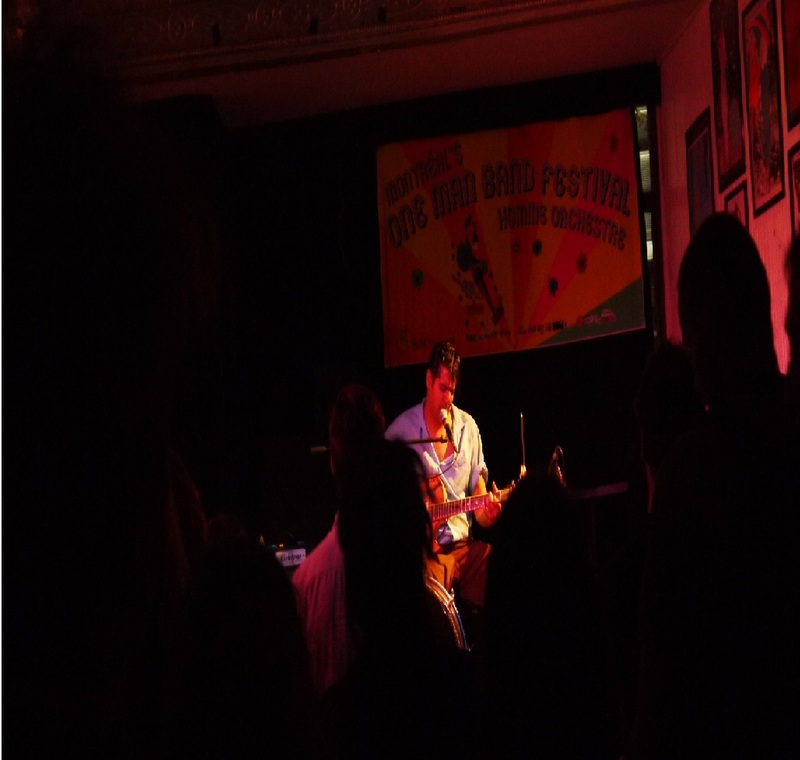 Last night marked the beginning of the festivities for Montreal’s One Man Band Festival. We (Eric and Dave) managed to do a bit of venue-hopping to take in some of the different artists on display during the festival’s opening night. Our venues of choice: Club Balattou, Casa del Popolo, and La Sala Rossa. Here’s a rundown on what transpired last night. We made our first stop of the night at Club Balattou, and were immediately greeted by a cozy and welcoming atmosphere. L’Octopus had already begun her set. She sat centre stage in front of a pretty decent crowd wearing octopus tentacles and holding an acoustic bass. Bass and voice is a rather uncommon combination for a solo performer, and has the potential to have a bit of an empty sound, but L’Octopus made use of her instrument for much more than simply anchoring the music with low notes. She used the strings to sustain chord progressions while tapping every other piece of the instrument, creating percussion that filled out the sound. 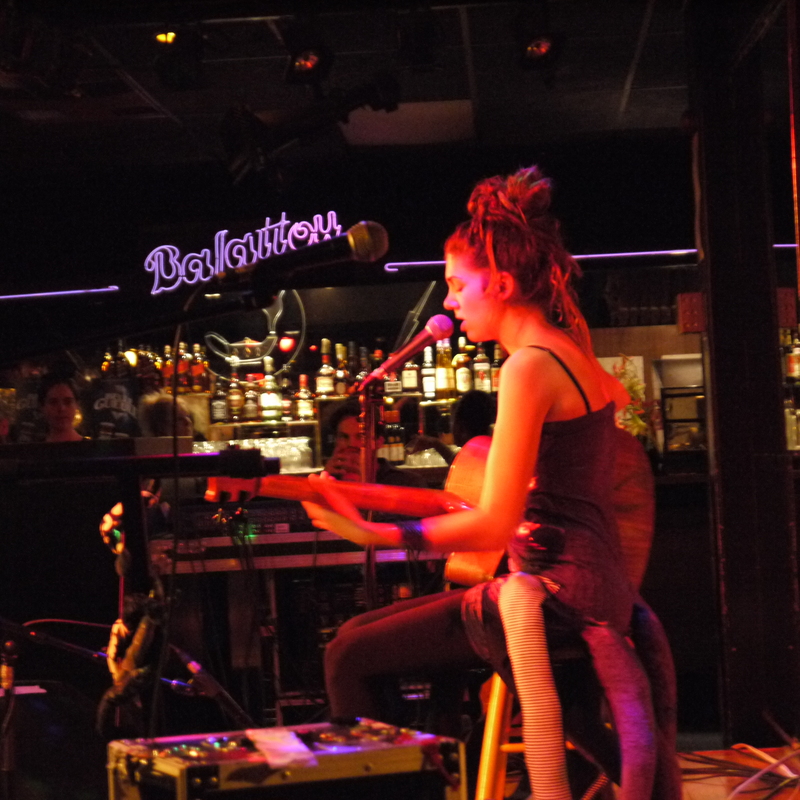 This feat of multitasking combined with her sweet, clean, and character-filled voice resulted in a calm and soothing set. We opened our festival experience by easing in with a nice cold beer and some easy tunes. This was a very unique performance one won’t soon forget. It was like being brought back to the 1950s, with raspy blues welted out in short yelps that would make the most downtrodden dog feel good about himself in comparison. Sometimes it didn’t even seem like Bill was speaking a proper language but more some sort of gibberish, but the mood and emotion was conveyed which was more than enough. Bloodshot Bill incorporated almost as much acting into his performance as old school blues. He contorted his mouth into shapes I didn’t know possible, consistently and ferociously shook his grease soaked head to an almost stomach turning effect, put the microphone in his mouth like that’s where it belonged, and put everything he had into the performance to create a steady stream of sweat down his face. That is to say it was a fun time. Given he was supposed to be a headliner of this festival, Pearson Sound was the biggest disappointment of the night. We arrived at the venue a little before his midnight open to find the room almost empty, with a few people sitting at tables on the side. After going back to the venue two more times, at 2 am we finally settled there briefly to find a crowd of around eight people, all men. Although it is not right to judge an artist based on the size of his audience, one large aspect of electronic dance music is having a good crowd to dance with. Unfortunately, that was not the case last night. From what we did hear of Pearson Sound though he sounded good, pushing the beat forward with a good intensity. It was a good listen, just wish there were more people- what happened Montreal?? One Man Band Festival continues tonight, we will out and about taking is as much music as we possible can, and we will be back with another report tomorrow.